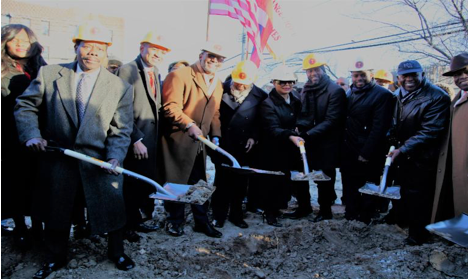 BROOKLYN, NY: The Evangelical Crusade of Fishers of Men, in partnership with community leaders and residents, broke ground on Sunday for a new low-income senior housing development project in East Flatbush. In communities throughout the City of New York, longtime residents are being displaced from their homes due to rising rents, tenant harassment and rapid gentrification. Seniors who live in apartments that are not rent-regulated on a fixed income are at greater risk for eviction through their landlord’s predatory practices. Due to the unprecedented need for affordable housing in Brooklyn, one of the epicenters of gentrification, this longstanding congregation is expanding their forty-five-year ministry by providing shelter that would enable seniors to age in place. The construction of this $45 million project has been financed through discretionary capital allocations from Brooklyn Borough President Eric L. Adams of $1,000,000 and Council member Jumaane D. Williams of $500,000, the Senior Affordable Rental Apartment (SARA) program of the NYC Department of Housing Preservation and Development, Bank of America’s debt and equity financing programs. “The Bishop Philius and Helene Nicolas Senior Residence Project is our answer to God’s call to serve the community and meet a fundamental human need – shelter. God has rewarded our faith by bringing to fruition a project that we’ve been speaking about for the past 12 years. This building will enable us to expand our capacity to help our neighbors live a better life. We are grateful for the opportunity to fulfill our mission on this earth and work with great partners to strengthen the East Flatbush community,” said Rev. Dr. Samuel Nicolas, Senior Pastor. The Bishop Philius and Helene Nicolas Senior Residence Project (BPHN), named in honor of the church’s founding bishop and first lady, is an 89-unit apartment building for seniors ages 62 and older earning less than 50 percent of the Area Median Income (AMI). The residence, located at 1488 New York Avenue, will consist of 88 studio rental units and 1 one-bedroom super’s unit. It will also include a community room, common area space, laundry facilities and on-site social services. Additionally, there will be a 10,575-sq.-ft. community service facility located on the first and cellar levels that the congregation has envisioned as a medical office suite for geriatric primary care. “Rodney Leon Architects is honored to be a part of The Bishop Philius and Helen Nicolas Senior Residence. This project was conceived and shall serve as an equitable, socially responsible and economically sustainable development model for faith-based and community development organizations throughout the city. The Bishop Philius and Helen Nicolas Senior Residence illustrates that successful affordable housing and economic development partnerships can be initiated by faith-based institutions for the long-term benefit and stability of the communities within which they are established,” said Rodney Leon, AIA, NOM.